Johnny English (Rowan Atkinson) is learning martial arts in Tibet as penance for an earlier disastrous mission. His Tibetan guru and mentor, Ting Wang (Togo Igawa), is actually an MI7 sleeper agent: their employers have requested Johnny's services. It is discovered that English's mentor has booked a one-way flight to London for him. Johnny accesses MI7's London headquarters, as it is discovered that the agency has been privatised by a joint venture with Japanese electronic giant Toshiba. Johnny rendezvouses with new boss "Pegasus", real name Pamela Thornton (Gillian Anderson), in the latter's office. MI7 (codenamed Toshiba British Intelligence) identifies him as the best agent for a new mission: stopping a group of international assassins before they kill the Chinese premier and cause global chaos. 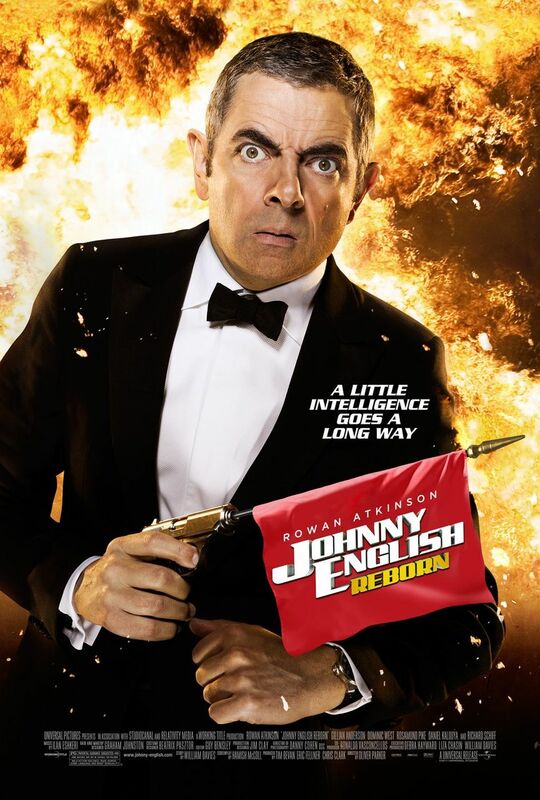 Now that the world needs him once again, Johnny English returns to his role with confidence. Hilarity ensues when he almost kills Thornton's tabby cat and falls off an exercise ball. Johnny rendezvouses with supposed friend and fellow agent Simon Ambrose codenamed "Agent One" (Dominic West), who in turn reintroduces him to Patch Quartermain (Tim McInnerny), MI7's resident inventor. Johnny is supplied with the following gadgets: a digital camera that fires high-powered darts, a satellite receiver, a tracking device and a voice-activated Rolls Royce Phantom (voice: Mariella Frostrup) that also comes with armour plating, a secret compartment in the trunk used to store an assortment of weapons and gadgets, a bonnet ornament-mounted laser with target-seeking capability and presumably autonomous capabilities, as the Rolls Royce Phantom is later discovered to be able to detect an obstruction and circumvent it. Patch himself states that the Rolls Royce comes with "all the bells and whistles" (meaning high-end enhancements), which might insinuate that this particular car is equipped with gadgets typically associated with armed spy cars (such as missiles and machine guns). Unfortunately, however, only the dart-firing camera and the Rolls Royce are used. In Macau, his Chinese contact is murdered in a casino by an unknown assailant, fortunately, however, English discovers a poker chip in the man's hand with information written down regarding Fisher (Richard Schiff)'s location. In Hong Kong, English meets up with him. He is an ex-CIA agent who ultimately reveals that he is a member of 'Vortex', a secret cabal of assassins-for-hire. Fisher is killed by an assassin (Pik-Sen Lim) dressed as a cleaner who then manages to escape, but English manages to track down and incapacitate the killer cleaner's accomplice in a fight at the pier, after subduing his backup. English manages to obtain one of three metal "keys" that, when combined, can be used to unlock an assassination weapon. While bragging to his sidekick Tucker (Daniel Kaluuya) about the success of his mission on a flight back to the United Kingdom, one of Vortex's members (disguised as a steward) uses trickery to steal the key from English's briefcase. English loses face with the Foreign Secretary (Andrew Woodall) and Pegasus at the latter's estate when it is discovered that the case is empty. English proceeds to assaulting Thornton's mother (Janet Whiteside) twice, both times mistaking her for the killer cleaner. Kate Sumner (Rosamund Pike), MI7's behavioral psychologist engages in an "off-hours" session with English, prompting him to recall the previous events of his failed mission in Mozambique (discovered to have been sabotaged by Vortex). He unearths the identity of the second member of Vortex as a result. English sets out again, this time meeting with Karlenko (Mark Ivanir), a Russian agent who is critically wounded by the cleaner lady assassin in front of him on a golf course. English and Tucker hijack Karlenko's private helicopter. Karlenko succumbs to the wounds he obtained when he was shot at by the killer cleaner, but not before revealing that Vortex's agents are members of the KGB, the CIA, and even English's beloved MI7. English arrives at a meeting in which those present include Pegasus, Ambrose, Patch Quartermain and the Prime Minister (Stephen Campbell Moore), alongside other high-ranking government officials. The Prime Minister declares that is vital for Britain to establish diplomatic ties with China, as rogue states in Southeast Asia have begun to secretly develop nuclear weapons. Simon reveals that the Swiss government have agreed to lend them Le Bastion for the talks, which is apparently their government fortress in the Swiss Alps. English accidentally breaks the lever on his height-adjustable office chair, resulting in a moment of sheer comic genius. Ambrose and English dine together, informing him that he knows a mole is present in MI7. Slater (Burn Gorman) gets ready to gun down English, until it is discovered that the latter person does not even know who the traitor is. Tucker confronts Ambrose in the bathroom stalls at gunpoint, discovering Ambrose is the mole, until English orders him to leave. It is revealed that, prior to the incident, Tucker managed to hack into Karlenko's computer, thus gaining access to a photograph of Ambrose and Karlenko in Mozambique (Ambrose previously lied about not knowing Karlenko). Ambrose and English converse together outside the restaurant, as Simon dupes Johnny into believing that Patch Quartermain is the traitor and that Patch always regarded Johnny with disdain. English, unaware that Simon is the mole, entrusts him with the key, which results in Ambrose contacting Pegasus and telling her that Johnny English is the traitor. English confronts Patch in a London church building, ultimately discovering that he has framed as the traitor. Johnny escapes MI7's clutches on Patch's high-tech wheelchair, equipped with retractable armrest-mounted pistols, a modified gearbox allowing him to reach enhanced speeds and a reclining seat. Johnny uses the armrest-mounted pistols to prevent wheelchair-bound citizens (Dave Holland) from using a wheelchair-accessible elevator, the advanced speeds to lose the tail from MI7 pursuers and the reclining seat to proceed beneath the undercarriage of a lorry. Johnny goes to Kate's house and convinces her that he is not the traitor and that the organisation Vortex is behind the assassination and that they were also in Mozambique (his disastrous mission that went wrong), before succumbing to the effects of a powerful sleeping drug released via the wheelchair and being rendered unconscious. When English wakes up, he notices Kate scrutinising footage of President Shambal's (Wale Ojo) assassination. The two realise that the behaviour of Shambal's bodyguard seemed abnormal and out of place. Together they find out that Vortex is using a drug called timoxeline barbebutenol (restricted material) that allows people to be controlled for a brief time before they die of heart failure. They also find out that the three "keys" are needed to access the drug. Kate reveals that she is travelling to Switzerland, and so won't be able to help. Meanwhile, Ambrose enters what appears to be a London office building, eventually gaining access to a vial of a mysterious fluid contained in a safety deposit box. He later meets up with his client, alongside his redheaded subordinate, as they confirm the previously agreed payment of 500 million USD, which is to be transferred to Ambrose's Swiss bank account. Later, Ambrose arrives to Kate's apartment to take her to the airport. After Simon leaves, English discovers that the killer cleaner is present in Kate's apartment. The killer cleaner attempts to kill him, even using a chainsaw built into her vacuum cleaner, as Johnny uses a garbage chute to escape, albeit he ends up in a nearby dumpster. English confronts former subordinate Tucker in the latter's bedroom and convinces Tucker to embark with him on a new mission. English and Tucker attempt to sneak into a heavily-guarded fortress in the Swiss Alps where the premier is to be assassinated. Unfortunately, however, English inadvertently activates a distress beacon (mistaking it for a rappel device) that uses some sort of voice simulator, which alerts the armed guards (Andrei Alen) to their presence. The incident ultimately concludes with the ejection of an aerial flare that alerts the armed guards to their location. Thinking quickly, English has Tucker attack him, with his subordinate faking his death with a pistol. English is put into a body-bag, as Tucker and English manage to gain access to the building. Tucker attacks the armed guards escorting them, as English attempts to hop over to Thornton's office, slamming his head into a nearby wall in the process. English finds Pegasus, head of MI7, and convinces her that Ambrose is the traitor, just before she attempts to drink the beverage in which the drug is present. English accidentally drinks it instead, rendering him vulnerable to Ambrose's commands. Pegasus is knocked unconscious by English, as ordered by Ambrose. Meanwhile, however, Tucker is cornered by Ambrose's redheaded accomplice, who draws a combat knife to Tucker's throat. Ambrose orders English to kill the premier, the man armed with a pistol disguised as a tube of lipstick. Meanwhile, however, Tucker manages to subdue his attacker when he disarms the woman of her firearm. English attempts to resist the effects of the drug after experiencing a flashback, thus remembering what his master, the monk, taught him. Johnny engages in a relentless fight with himself, as Tucker attempts to interrupt Ambrose's frequency used to communicate with English via a Toshiba laptop. English gets ready to kill the Chinese premier, before Tucker finally disrupts the frequency via an unorthodox method: using a local radio station which causes Johnny to dance to the music. The effects of the drug wear off, as English collapses and seemingly dies of heart failure. However, Johnny is revived by Kate, who kisses him on the lips, as his heart rate escalates. Johnny attempts to chase after Simon, jumping off the building and using a parachute to safely descend to the snow. English hijacks a snow-mobile and chases after the MI7 traitor. Eventually, Johnny catches up to Simon, who is using an air-suspended gondola lift. He launches the snowcat off a cliff, as he is seen to be clinging onto the cable-car. The two engage in a fistfight, with English notably enduring several kicks to the groin. Johnny manages to eventually obtain Simon's pistol, yet falls off the car, the snow fortunately breaking his fall. Ambrose tries to shoot English with said pistol, which culminates with English pulling out his supposedly bulletproof umbrella which actually shoots a rocket at the cable-car, killing Ambrose. English is knighted, but, during the ceremony, he finds out that the Queen is the killer cleaner in disguise, and she tries to kill him yet again. He chases after her and violently hits her on the head with a tray, only to find out, when the guards bring the real killer inside, that he has attacked the real Queen. In the post-credits scene English is seen making a takeaway for Kate Summers to the tune of "In the Hall of the Mountain King".